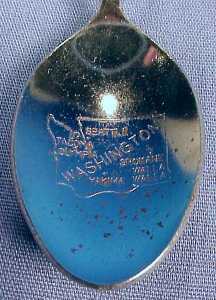 Vintage silver colored Fort Lewis, Washington collectible souvenir spoon made in Japan featuring a colorful shield representing Fort Lewis under Lucite, with a decorative twisted spoon handle and engraved spoon bowl with an outline of the state of Washington. There are a few condition issues; the bowl has some oxidation and the back of the spoon handle has a few areas of rust. None of these issues affects the usability or display ability. Fort Lewis, named after Meriwether Lewis of the Lewis and Clark expedition, is one of the largest and most modern military reservations in the United States. 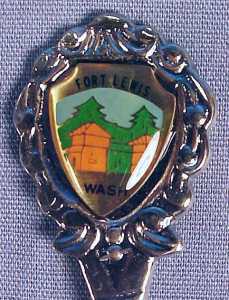 Fort Lewis was originally established in 1917 with the passage of a Pierce County bond measure to purchase 70,000 acres of land to donate to the federal government for permanent use as a military installation. In 1927, Pierce County passed another bond measure to establish a military airfield just north of Fort Lewis. The airfield, called Tacoma Field, opened in 1930 and was renamed McChord Field in 1940. McChord Field separated from Fort Lewis when the U.S. Air Force was created in 1947 and was subsequently renamed McChord Air Force Base. The two bases operated independently of one another for over 60 years before being merged in 2010. Joint Base Lewis-McChord (JBLM) (IATA: TCM, ICAO: KTCM, FAA LID: TCM) (IATA: GRF, ICAO: KGRF, FAA LID: GRF) is a United States military facility located 9.1 miles south-southwest of Tacoma, Washington. The facility is under the jurisdiction of the United States Army Joint Base Garrison, Joint Base Lewis-McChord. The facility is an amalgamation of the United States Army Fort Lewis and the United States Air Force McChord Air Force Base which were merged on 1 February 2010. This vintage silver colored collectible souvenir spoon from Fort Lewis, Washington measures 4.5" in length, weighs .4 ounces and is marked on the back of the spoon handle with JAPAN.